The Sunday concerts at Conway Hall are a regular feature of London's concert life, providing a wide variety of chamber music performed by established performers and up and coming young artists in the intimate surroundings of Conway Hall. On Sunday 22 January 2017 we went along to hear Trio Anima (Matthew Featherstone flute, Rosalind Ventris viola, Anneke Hodnett harp), in a programme of French music including Debussy's Sonata and Syrinx, Theodore Dubois' Terzettino and Reynaldo Hahn's Romanesque, plus arrangements of Debussy's Children's Corner, and Ravel's Le tombeau de Couperin. It was Sebastian Erard's invention in the early 19th century of the double-action pedal harp, permitting greater access to complex chromatic music on the instrument, which allowed composers to use the instrument more. But progress was slow, partly because of the lack of instruments and good players, but by the end of the 19th century the harp was common in orchestral music. In chamber music things were somewhat slower, with the repertoire being dominated by salon-style music. It was Debussy who very much put writing for the harp in chamber ensembles on the map, and in his late Sonate for flute, viola and harp he took the ensemble out of the parlour and into the complex world of 20th century chamber music. The programme from the Trio Anima presented Debussy's Sonate in context, giving us a snapshot of music in Belle Epoque France in the first half, and then in the second we heard two works which arose out of the First World Way, Ravel's Le tombeau de Couperin (in Paul Silverthorne's arrangement) from 1919 and Debussy's Sonate for flute, viola and harp from 1915. Theodore Dubois (1837-1924) is one of those 19th century French composers, significant in their day, whose music has been largely forgotten. Dubois studied at the Paris Conservatoire under Ambroise Thomas and won the Prix de Rome in 1861. His Terzettino for flute, viola and harp of 1905, was pure salon charm, as the flute and viola wove wistful Fauré-esque melodies over a rippling harp accompaniment; the complexities of Debussy were a long way away. The Romanesque by Reynaldo Hahn (1874-1947) had similar charms. Originally a movement from Hahn's 1905 suite Le bal de Béatrice d'Este, Hahn transcribed the movement for flute, viola and harp in 1910, resulting in a piece where a sinuous, almost Celtic melody wove its way over a rippling harp. The Sonatine by Maurice Ravel (1875-1937) was written as a solo piano piece dating from 1903-5. the French harpist Carlos Salzedo successfully re-invented the work for flute, viola and harp, renaming it Sonatine en trio. It is a remarkably successful re-incarnation, making best use of the particular qualities of the three instruments and letting us forget the original. The first movement allowed us to appreciate the responsive playing of the three members of the trio, as they created delicate textures with a lovely clarity, and a nice fluidity. There was an elegant flute solo in the middle movement, with some ravishing textures, and then the final Animé, with some striking instrumental writing and a lively sense of ensemble. Next came two solo moments, first a beautifully supple account of Faure's song Après un rêve from Rosalind Ventris and Anneke Hodnett, and then Debussy's flute solo Syrinx played by Matthew Featherstone, which was originally written to be played off-stage as incidental music to a play, Featherstone played it from the hall's balcony, capturing the work's haunting quality with seductive yet cool tones. The final work in the first half was Carlos Salzedo's arrangement of Debussy's Children's Corner, the 1906/08 suite for piano. Salzedo had originally transcribed it for flute, cello and harp, so Trio Anima played their own adaptation of the transcription. Again this was a successful re-incarnation of a popular work. The scales in Doctor Gradus ad Parnassum had a rather different effect when rippled on the harp, but overall the movement was very seductive. Remarkably, Jimbo's Lullaby with its flute solo had a rather oriental quality, as did Serenade for the Doll where the players brought out the varied and delicate instrumental textures. The Snow is Dancing was suitably evanescent, whilst The Little Shepherd had an evocative flute solo which harked back to Syrinx. Golliwog's Cakewalk brought things to a close with a swing, with crisp rhythms and vibrant playing. Throughout the suite we were able to appreciate the superb sense of ensemble between the players, and the impulsive vitality of their playing. Maurice Ravel's Le tombeau de Couperin was originally written for solo piano written in 1914-17, with Ravel subsequently orchestrating some of the movements. We heard three movements in an arrangement by viola player Paul Silverthorne. Prélude had a lighter texture than the piano version, with the players taking it a quite a speed so the semiquavers really did flow beautifully. The Menuet was elegantly formal with some intense moments in the trio, and there was an engaging vitality to the final Rigaudon with a more languorous trio. The movements of Ravel's piece were inspired by the keyboard pieces of Francois Couperin, and next the group played an arrangement of one of Couperin's harpsichord pieces, La superbe (1690), where 17th elegance in modern guise alternated with more sprightly passages. The final work in the programme was very much the culmination, Debussy's Sonate one of a group of sonatas he planned to write for various groupings of instruments. Here Debussy really did take the flute, viola and harp trio out of the parlour, writing music which had an elegance to it but with a sense of darkness underneath. The music was written during the First World War at a time when Debussy was severely ill and in pain. There was a haunting feel to the opening Pastorale with a real spareness to the writing, and we could appreciate how Debussy treated the three instruments as equals rather than using the harp mainly for accompanying. The three players brought an improvisatory feel to the music, combining seductive beauty with melancholy. There was a fine feeling of freedom in the Interlude, with lots of fine detail and sense of the players' control over the texture, and responsiveness to each other. Debussy's writing is eternally changeable, and the responsiveness of the players both to the music and to each other was impressive The Finale was fast but not furious, with great interplay between the individual performers as they brought out the more disturbing elements to the music. 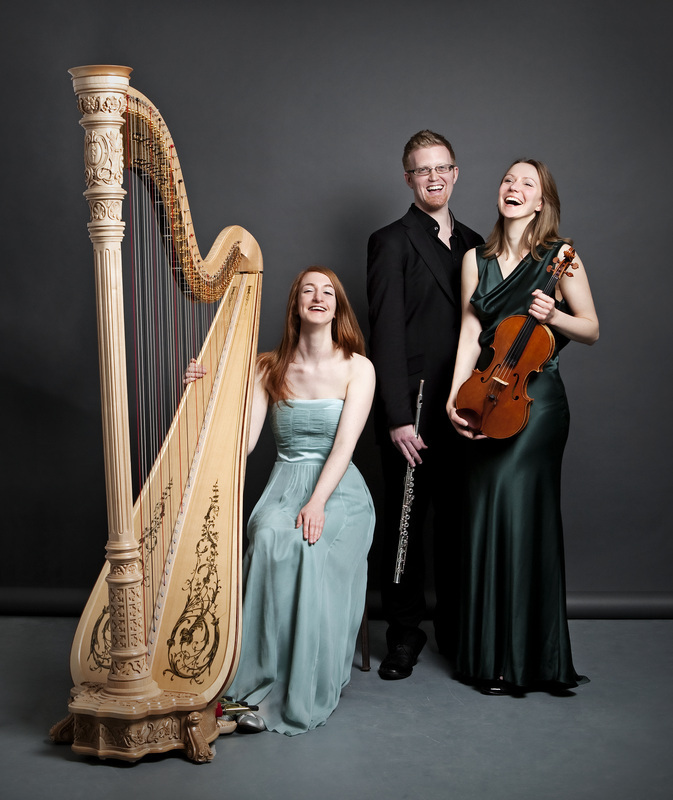 Trio Anima was formed in 2006, and all three players have strongly established careers. There was a real sense of ensemble to their playing, with the freedom and fluidity which can only come with familiarity, and a maturity of expression particular in the Debussy. The individual members of the trio introduced the programme, giving us an engaging sense of their thinking behind the programming.